I have read it through three times, and think it is one of the most impressive historical works I’ve ever read! In fact, I went out immediately and bought “Voices of Morebath”, “Marking the Hours”, and “Faith of Our Fathers”—and I intend to buy “Saints and Sinners” and “Walking to Emmaus” as soon as I have the money. (Derek: you should surely see “Marking the Hours”.) My impression is that Duffy is an incredibly learned and very well-spoken Roman Catholic scholar—which means, of course, that his scholarship will be vaguely tinged with his own convictions, but on the whole I think he is very academically respectable (and certainly engaging). You’re absolutely right on the anecdotal thing, but at least most of his anecdotes are fun! Marking the Hours was also under the Christmas tree and will be inhaled as soon as this one is done! This post is inspiring me to go dust off my first-edition copy and actually read it! 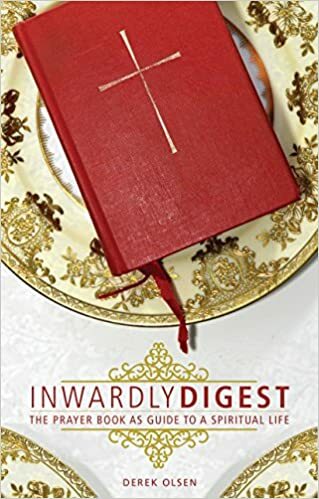 I bought it for a seminar some years ago, before 1) I was an Episcopalian, 2) I was obsessed with Anglicanism, and 3) I was into the history of liturgy. This non-specialist read it several years ago and highly recommends it! Two words for you regarding the lack of a seminary library near by: “Interlibrary loan.” It’s not just for academic libraries. Any book an academic library can get for you, your local public library system should be able to get, if you have a modicum of patience. Almost always free, or very modest cost imposed by the loaning library. Befriend your local reference librarian, learn when their less-insanely-busy times are, and get them to explain whatever the local process is for demonstrating that you’ve checked the local catalog and this is what you need from ILL . . .
Love love love this book. Haven’t read it in years but I own it and did read it in its entirety (thanks to his Tedness). Enjoy reading your thoughts on it. I thought you’d appreciate this one. I find that it dovetails nicely with the conference where we met. Indeed, some of the work done and presented on there I think comes out of some of the material and methods first started here. I read it several years ago. Loved it! Probably doesn’t count, but I just finished watching “The Tudors” on Amazon Prime. As it happens, I am reading “The Stripping of the Altars” as well, Derek – loaned by a friend. I know Duffy best through his literate book reviews done occasionally for THE TABLET. I’ve enjoyed “Altars” so much I have also acquired “Voices of Morebath”. Based on these comments and previous reviews I had read, I’ve just ordered “Marking the Hours” and “Walking to Emmaus”. In addition to his superb scholarship, Duffy served for a time as president of Magdalene College, Cambridge, where he is a fellow. I shall have to read this one — earlier reviews put it on my ‘sometime’ list but your comments encourage me to upgrade that ranking. Incidentally, my interest in liturgy goes back to High School years, and I actually first read Shape of the Liturgy then (about 60 years ago), and in those years it seemed to be fairly widely read (mostly by those older than I, but sharing that interest) and I hope Stripping the Altars will have similar success. He also argues that Marian England was the “laboratory” of the later Counterreformation; and that some of Pole’s closest (Italian) friends and collaborators played an important part in the institutionalization of the Counterreformation in the Archdiocese of Milan under St. Charles Borromeo from the 1560s onwards.